Our family summer vacation inspired my latest shadow box. We rented a rustic lodge on a quiet lake in New Hampshire that is a loon sanctuary and spent our week swimming, kayaking and listening the the melodic call of the loons. It was a wonderful week and I came home and with a design idea to remember the special times. I also experimented with different backgrounds. Here are two more versions. Loon Lake 3D Shadow Box is a four-layer shadow box. Each layer is created and then they are stacked together creating the illusion of greater depth.The construction techniques are basic 3D techniques and are clearly explained in the tutorial which is included in pdf format in the download. The tutorial can also be viewed online before purchase. The finished design is about 6.5 " square and all parts fit on 8.5 x 11" card stock. The background paper can affect the impact of the design and it is a great place to experiment. I have included 3 jpg images with the download for you to choose from for the Loon Lake project. 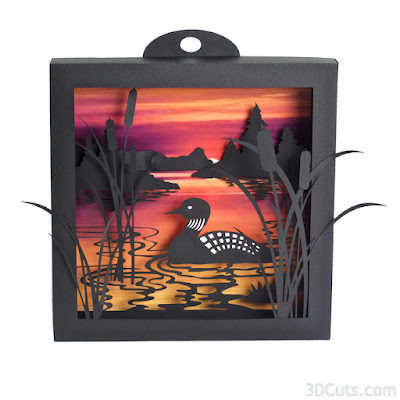 These papers can be printed for many uses, not just this shadow box.